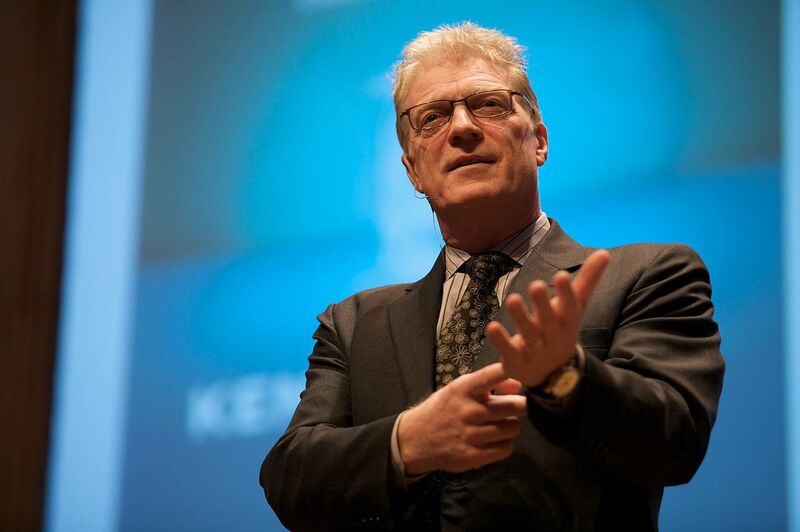 Tonight Sir Ken Robinson addressed a crowd of over 1,000 parents that spilled out into the parking lots surrounding the auditorium at Sacred Heart in Atherton. In a performance that topped even his 10-balloon TED Talk, he delivered a lecture with equal parts inspiration and humor. I was bummed that "Sir" Ken showed up with no sword and without any armor AT ALL. But he does wield a mighty pen that has inked two books on the importance of helping kids find their passions (The Element) and of adapting our educational system to prize creativity over conformity (Out of our Minds: Learning to be Creative). Here's the basic arc of his message: most people are miserable in their jobs, drudging through work in anticipation of the weekend. Only those of us who have found our passions love to work. Everyone has talents and interests to ignite, but usually schools have pushed them aside in favor of standardized academic curricula and tests. At a time when our economy has moved beyond factory jobs, we need creative, entrepreneurial citizens. That all happens only in personalized programs, where kids are encouraged to follow dreams. As Steve Jobs liked to say, people change the world by following their dreams, not a standard formula for success. Sir Ken cited many examples, like Paul McCartney and George Harrison, who went to school together and loved music but didn't enjoy music class. Their music teacher never thought they had potential as musicians. "He had half the Beatles in his class and missed it. That was a bit of an oversight, if you don't mind my saying." "It's a mistake to confuse standardizing with raising standards." "I asked the girl what she got out of her dancing class. 'I got a B' she answered." "We should be teaching students, not subjects... Schools are more like organisms than mechanisms. Teaching is more like gardening than engineering." "We cannot predict what will happen, where people will go and how they will develop. We have to let them find their way, and encourage them to trust that they can follow their passions. If we do this we may not be able to predict the future, but we will create a future that we all want to live in." In the audience I saw nearly every school principal in town nodding along with Sir Ken's talk, as though they already follow his advice in their schools! I know some who do, but if they all did, then where's the problem? "I was shocked to hear that my TED Talk was downloaded 10 million times. But then I learned that two cats jumping around on YouTube was downloaded 50 million times." "I’m now working on the sequel to The Element, called Finding your Element. People keep asking me how to find it. Now I wish I had never started this whole thing. How do I know? YOU find it, leave me alone. No, seriously it’s coming out next year and it’s going to be terrific." Thanks for the notes David. I look forward to reading his new book when it comes out. School's standardized approach to teaching students was an attempt at a uniform process,in hopes that all students will get equal opportunities for growth. The problem is that this approach needs to be able to think outside of the box. Thanks for the summary of the lecture. As a 3rd grade teacher, I think there is certainly a need for ed reform at a national level. Yet, while creativity certainly needs to be nurtured early and often, it's often hard to do so when dealing with the realities of education in urban public schools. The key to successful education reform seems to be mostly about repeated and sustained investments in school leaders, teachers and these communities.